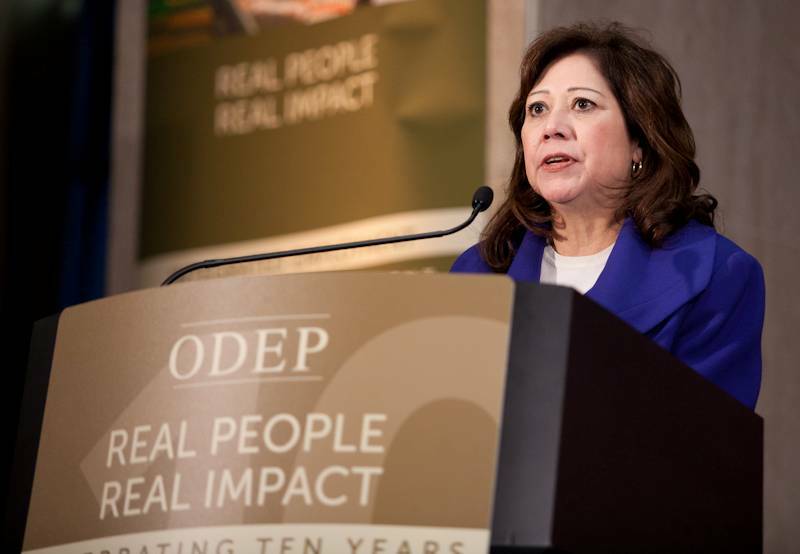 “Thanks to ODEP’s hard work, the conversation has shifted away from whether people with disabilities can work to what tools and supports are needed to assist them in doing so,” said Secretary Solis during ODEP’s 10th anniversary celebration. 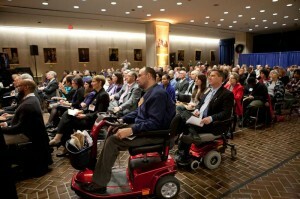 Today, the U.S. Department of Labor’s Office of Disability Employment Policy celebrated its 10th anniversary. In the decade since joining the DOL family, ODEP has been challenging outdated stereotypes and attitudes that keep people with disabilities out of the workplace, while aligning policy and practice to open the doors to employment opportunities. At this juncture in ODEP’s history, it is important to reflect on the agency’s achievements and influence in developing disability employment-related policies and practices. During the agency’s inaugural year, it instituted a number of initiatives that served as the foundation for programs that are ongoing today. These include the Job Accommodation Network, Workforce Recruitment Program and grants to fund training and demonstration projects to assist adults and youth with disabilities. In 2008, due to the joint efforts of ODEP and the Bureau of Labor Statistics, for the very first time our nation started to collect statistical data about the employment rates of people with disabilities through the Current Population Survey. The addition of this data has allowed BLS to develop a Special Disability Tabulation similar to the information on the employment of women and minorities. Last year, we launched the “Add Us In” Initiative to harness the enormous growth rate in the minority owned small business sector in order to improve employment opportunities for Americans with disabilities. Many of these businesses have shown a deep commitment to take care of their own, and working together, we are showing them how. And just last week, DOL’s Office of Federal Contract Compliance Programs proposed a new rule to strengthen the affirmative action obligations of federal contractors and subcontractors to improve job opportunities for people with disabilities. The proposal would revise and update Section 503 of the Rehabilitation Act of 1973, thereby giving millions of Americans with disabilities a better and fairer shot at competing for jobs. It would also create greater clarity for businesses on what is expected of them, leveling the playing field so that employers who play by the rules aren’t at a disadvantage against those who shirk their legal responsibilities. More than 200 stakeholders, staff members, and government leaders filled the department’s Great Hall for the anniversary event. Our proposed rule is historic; businesses with at least 50 employees and $50,000 or more in government contracts would be required to set a hiring goal of 7 percent for workers with disabilities. With Federal contractors and subcontractors accounting for nearly a quarter of the nation’s workforce, this proposed rule is a concrete step to ensuring that discouraged workers in the disability community have access to additional meaningful employment opportunities. I urge each of you to read our proposal and to submit comments on how we can make it better. In addition, ODEP’s reach and leadership has extended beyond the Labor Department through the strong support of its mission by this Administration. As a result of the President’s Executive Order 13548, more federal job opportunities are available to persons with disabilities, and more people who attain disabilities while working for the Federal government will be provided with the support they need to return to work successfully. The Administration has also supported inclusion and improved outcomes of students with disabilities and the preparedness of teachers to meet diverse learners’ needs. The “Year of Community Living” was also launched to improve access to housing, community supports, and independent living opportunities. These are only a few examples. Deputy Secretary of Labor Seth D. Harris; Kathleen Martinez, assistant secretary of labor for ODEP; past assistant secretaries for the office; Tony Coelho, chairman of the President’s Committee on Employment of People with Disabilities from 1994 to 2001; Becky Ogle, executive director of the Presidential Task Force on the Employment of Adults with Disabilities from 1998 to 2001; and individuals who have been the beneficiaries of ODEP’s work pose for a photo. Increasing federal employment of people with disabilities—like Joy Welan, a person with cerebral palsy and trial attorney at the Department of Justice’s Civil Rights Division who works every day to advance America’s promise of equal opportunity for all. Ensuring that federal contractors uphold their commitment to a workplace inclusive of people with disabilities—like Helen Chang, a person who is blind and a web developer who designs custom systems to help various components of our nation’s military run more efficiently from a technology perspective. Providing flexible work arrangements, such as customized employment, for people with disabilities—like Ricardo Thornton, a person with an intellectual disability and a library clerk who takes great pride in ensuring community residents are satisfied with his branch’s service and collection. Ensuring that the nation’s civilian workplaces are welcoming to veterans with disabilities—like Matthew Staton, a veteran with visible and non-visible disabilities and a staff assistant to the Secretary of the Army, who helps ensure that military families get the support they need before, during and after deployment. There is much to celebrate, but also much more to do. 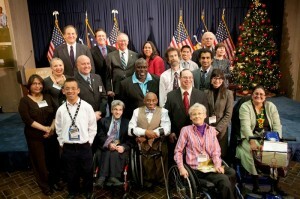 With our recovery picking up steam, it is important to reiterate upon ODEP’s 10th anniversary that when I speak of “good jobs for everyone” that includes people with disabilities. We know that there are many other folks out there like Mathew, Joy, Helen and Ricardo who want to work, and have unique insights, skills and talents that American employers need. ODEP’s work over the past 10 years has laid a solid foundation and I wholeheartedly believe that with ODEP’s talented and dedicated staff leading our efforts into the future, we can and will succeed.